You can substitute ground turkey for the chicken. But don’t omit the chocolate —it’s the key to the flavor. While I discard the stems from the dried chile peppers (serrano and chipotle), I use the seeds as I savor that heat! 🙂 But feel free to discard the chile seeds, or even use a milder chili powder, if you prefer a less assertive heat level. If you have an abundance of fresh tomatoes, 3 pounds of them will substitute nicely for both the canned tomatoes and tomato sauce. In fact, if they’re sweet, you shouldn’t need to add any sugar. Also, you can use 2 cans of tomatoes, instead of 1 can of tomatoes and 1 can of tomato sauce. If you don’t have an ovenproof pot, you can do the long cooking on the stovetop over low heat. The oven does provide more even heating, though. Yes, you really do need to cook this for a long period of time! If you eat the chili after less than 3 hours of cooking in the oven (or stove), the flavors will be far too harsh. I’ve found that the flavors start to integrate well after 6 hours, but become mellow after 10 hours. I’m still trying to figure out the best starch side to serve with this: should it be a baked potato, pasta, bread or boiled rice? Corn tortillas? Or…? Crème fraîche or sour cream are good garnishes, as is a sprinkling of grated cheese (Cheddar, Gruyère or Monterey Jack), or crumbled cheese like queso fresco. 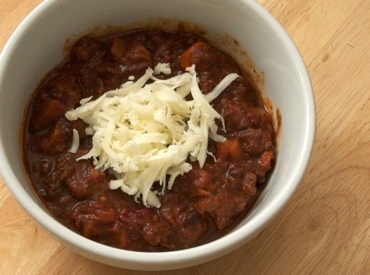 This chili freezes well, as long as you exclude any starch or dairy accompaniments. Reheat the frozen chili in a covered, ovenproof dish at 375F degrees for 20 to 30 minutes. (Update: 27 October 2013). So far, either cornbread or baked sweet potato make the best sides for this chili! (Unless you have the patience or source for fried or baked plantains, or corn tortillas, both which are also very tasty.) Also, if I don’t have cashew butter available in the future, I might try almond butter as a substitute. (Update: 13 January 2013). This time I redid the chile combination: 2 chipotles en adobo plus a tablespoon of their sauce, while omitting the dried chiles and using just 1 heaping tablespoon of chili powder; 1 1/2 ounces of the unsweetened Mexican chocolate (still); 1 pound of home-roasted tomatoes instead of the canned tomatoes and sauce (added an extra can’s worth of water); omitted the black (or white) pepper, banana, and maple; and added 2ish tablespoons of cashew butter. Also decided to cook on the stovetop instead of the oven, since our new-as-of-2010 kitchen has a snazzy low-flame burner—which took about 3 hours. Homemade corn tortillas went well, along with some leftover mashed sweet potatoes. A tender, moist starch that has a bit of sweetness seems to be key. (Update: 6 Oct 2008). I found that adding a chopped banana adds a pleasant, creamy texture. Didn’t taste any banana-ness after the many hours of cooking. I also used 1 1/2 ounces of unsweetened Mexican chocolate (by Oaxacan Foods), which contained almonds and (more) cinnamon. Nevertheless, I’m still looking for a good starch accessory: I’m rather bored of potatoes, and spaghetti reminded me too much of pasta Bolognese, which I don’t like. (Update: 20 Nov 2006). Today we used the last of this year’s garden tomatoes. Since I didn’t use my usual roasted canned tomatoes, this was a great excuse to try out the smoked Spanish paprika which I had purchased on a whim from Penzey’s (to substitute for the sweet paprika). Still feeling experimental, I substituted one big dried guajillo chili for the serranos, and one cup of beer (Young’s Double-Chocolate Stout) for the water. (I learned that beer is a better choice in chili, instead of wine (i.e., if you feel the urge to add alcoholic flavorings); I found that the latter made it too tart.) Anyhow, the result of these modifications was a somewhat milder chili, with a deeper flavor. 1/4 to 1/2 cup garlic, chopped; I omit this if I end up using garlic oil for the above oil. In a large dutch oven or ovenproof, heavy-bottomed pot, sauté the chicken in 1 to 2 tablespoons of oil (or ghee) over medium high heat until no longer pink. Transfer the chicken and its liquids into a covered bowl and set aside. Add the remaining 1 to 2 tablespoons of oil to the dutch oven, and sauté the onions and carrots over high heat until the onions are translucent. Lower the heat to medium high, then stir in the garlic and bay leaf. Let cook until the carrots are tender, about 10 to 15 minutes. Stir periodically so that the garlic doesn’t get burnt. Add the spice mixture, and sauté until it becomes aromatic. Stir in the black beans, tomatoes, tomato sauce, water, chocolate, and banana, if using. Add the chicken and its liquids back to the dutch oven. Add the maple or brown sugar, if desired. Once the chili has come to a simmer on the stove, transfer it to the oven. Stir the chili every hour or two, so that it doesn’t stick. You can gradually lower to the oven temperature to 300F degrees, as long as the chili remains simmering; I can usually do this within its first hour of being in the oven. Cook for at least 6 hours, preferably more. The canned tomatoes, sauce and beans often contain salt, so you might not need to add more —however, if desired, add more salt, to suit your taste. Serve in bowls. This was written by sairuh. Posted on Sunday, September 17, 2006, at 12:22 pm. Filed under Food. Tagged casseroles, chicken, chiles, chocolate, Mexican, recipe, stews, tomatoes. Bookmark the permalink. Follow comments here with the RSS feed. Post a comment or leave a trackback.